Nihonbashi Bakuro Yokoyama Wholesale District (日本橋馬喰横山問屋街) is the biggest cash-only wholesale district in Tokyo. 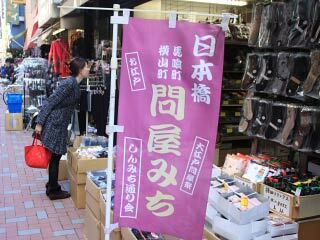 There are over 120 stores on the main street called "Shinmichi" St.. There are many women's wear for all kinds of purposes or genders, such as kids, teens, ladies and Kimono. Also, bags, huts, accessories, and even men's wear. Also, there are wholesale shop of daily glossaries, towels and others. It is one of the best shopping spot in Tokyo, and all of them are very reasonable price. Because it is a wholesale district, most of the stores close on weekend. Some of them won't sale a private quantity. 1. use JR Sobu Line to Bakurocho. The history of the wholesale district of Bakuro Yokoyama began in Edo period. In 1792, there were 19 wholesale stores in this area. It grew upto 62 stores in 1827, and in 1851, there are 144 stores. Bakuro and Yokoyama were the post town of Edo city. So, many people stayed here and enjoyed shopping. There were, glossaries stores, drug stores and book stores. It was just like shopping district today. Especially, Bakuro was used to be a horse market place. Because it was also the post town, many people want to buy Edo hip of accessories, cosmetics, tobacco, and bags in Edo period. Today, it is still be biggest wholesale district in Tokyo. Especially, there are many women's wear stores.